I go to ballet and jazz classes every week. I used to do tap and acrobatics too, but I'm not studying those right now. 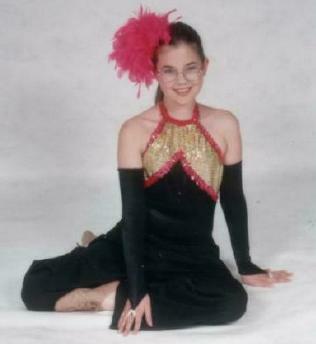 The picture is of me in my jazz costume for the spring 2001 recital. I make lots of things for my family, and I help Mommy with her stitching and beading. I don't like to use patterns as much as Mommy does - I usually just make up my own designs. I enjoyed the special class Stoney Creek sponsored just for Girl Scouts at the 2001 Creative Arts & Textiles Show. Right now I'm stitching a piece from Cattitudes: The Fifth Litter. It has a cat wearing a spiked collar chewing on a bone and the words "Dare to Be Different." I like making music too. I took piano lessons for three years, and then took voice lessons. I got an ocarina at the Georgia Renaissance Festival a couple of years ago and I like playing it and the ukelele Mommy has from when she was little. The ocarina is sort of like a little round ceramic flute that I can wear on a string like a necklace. It's easier to play than a flute because your fingers don't have to be so long to reach the four holes. I like going to housefilks with Mommy, too. Copyright © 1996-2006, Katie and Cynthia Armistead, All Rights Reserved.